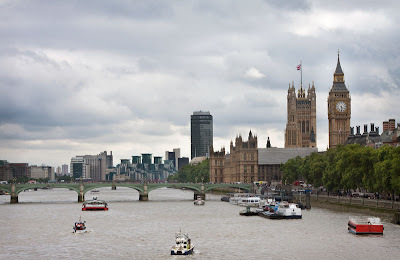 A view of Westminster Bridge from Hungerford Bridge. this is a fabulous view of the Parliament House as well. great looking bridge. Makes me want to catch the next Eurostar! Have a great Sunday! That is a a great picture. So expansive. Wish I was there! Oh, it's so beautiful! I'd love to see that in person. Wish I were there to take in that view in person! Wonderful photograph! I sometimes think London is best seen from the river. Wonderful vantage point! Makes me wish I was back in London! It looks like a perfect postcard scene. One of the better views from a bridge in London, and there are lots to choose from! Great shot! I came back with so many pics of bridges after being in London last year. Such open space to frame the buildings. Love it. That's SO London, clouds and all. Great capture. A perfect London view ! !